The purpose is to create a political narrative to divert attention from the Bhima Koregaon probe. 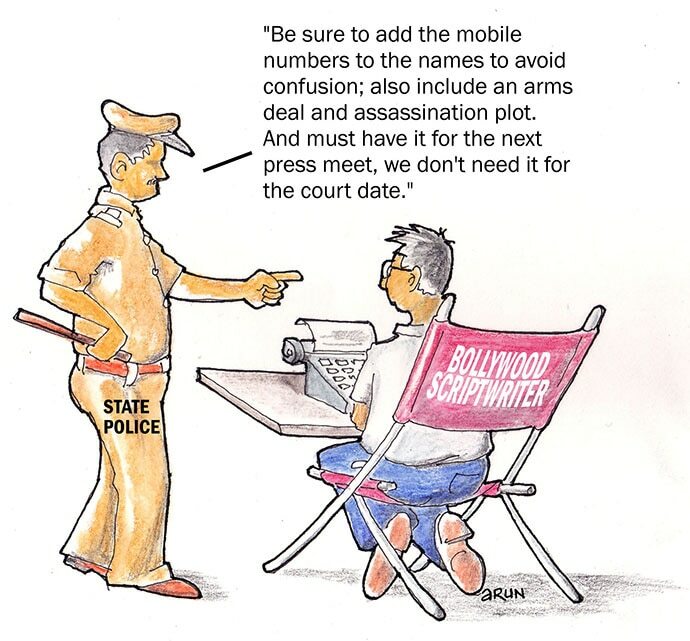 The sinister sensationalism around the arrests of advocate Surendra Gadling, professor Shoma Sen, Sudhir Dhawale, Rona Wilson and Mahesh Raut, as alleged Maoists, is rising to shriller heights with a new letter being released by the media every other day. These so-called letters, which have been refused to the defence lawyers of those arrested, are being freely “leaked” and being read out on live television. The sole purpose seems to be to whip up a false narrative, favourable to the current regime. Sidetracking the demands of the Dalit movements to punish the Hindutva leaders and the organisations responsible for the attacks of January 1, 2018 on the congregation at Bhima Koregaon can be another probable purpose. We have had an ample amount of personal experience of bizarre “disclosures” by investigating authorities at the time of our arrests. The so-called evidence is leaked to the press and wild allegations are made, which promptly disappear at the time of trial. Meanwhile, the media trial on prime time television commences and builds upon a false narrative to create a fanciful impression on the minds of people at large. The actual courtroom trial will later show that there was not even an ounce of truth in the stories told, but no attempt will be made by the media to correct the wrong notions they originally created. When Arun Ferreira, the co-author of the piece, was arrested in May 2007, the press was told that he was the “communications chief” of the CPI (Maoist). That he and his co-accused were planning a bomb blast at the Deeksha Bhoomi in Nagpur. The media went to town with it. But during the trial, which lasted for more than four years, there was not even a single attempt to mention either of these charges, leave aside producing any evidence to support them. The accusation in 2007 of planning an attack is today mirrored by a vague submission of a patently fabricated letter that supposedly suggests a “Rajiv Gandhi-type plot”. At the trial stage, this is bound to disappear into thin air. But at the media trial stage, it has already become a “plot” to assassinate the prime minister, one more in a long line of such stories. When Vernon Gonsalves, the other co-author of the piece, was arrested in August 2007, he was claimed to be in charge of the finances of the Maoists. A delegation which approached the then home minister of Maharashtra, RR Patil, on Vernon’s behalf, was told by the then ATS chief KP Raghuvanshi that they had evidence of numerous bank accounts with huge funds. The trial went on for almost six years without any evidence regarding the funds being ever brought before the court. In fact, the money that the police claimed to have found with Vernon’s co-accused was ordered by the court to be given back to him. Today, the accusations regarding money are somewhat more farcical. The claim is that the Congress funded the Maoists, who, in turn, funded the Elgar Parishad of the Bhima Koregaon Prerna Abhiyan. Before going into the absurdity of this charge, it would be wise to remember a similar story was built around the time of Arun Ferreira’s arrest. During his narco analysis, he was reported to have said, "Bal Thackeray and his party Shiv Sena and the BJP student wing Akhil Bharatiya Vidyarthi Parishad (ABVP) had given us funds on regular occasions for Maoists activities in Mumbai." Of course, nothing regarding this was ever brought before the courts by the prosecution. We should expect the same regarding today’s allegations. However, there is one major difference in today’s scenario. At that time, the report of funding of the Maoists by the Shiv Sena and ABVP appeared less than a year before the 2009 general elections and the Maharashtra Elections. But it was not made an issue by the then ruling UPA government. They probably well realised the absurdity of the report and the flimsiness of its evidential value and did not want to shame themselves by claiming any authenticity for it. This is not the case now. We had none less than the national spokesperson of the BJP, Sambit Patra, addressing a half-hour-long press conference on a blatantly false letter, implying that the Congress was funding the Maoists through Gujarat MLA Jignesh Mevani. The so-called letter requires only a bare reading to see its poorly fabricated nature. The prosecution advocate realised this too well, which explains why he did not give it to the defence lawyers, as it would expose before the court the specious nature of their allegations. Such considerations do not, however, exist in media trials. Patra’s copy of the letter he displayed at the press conference seemed well researched and was highlighted in various colours. But he deliberately remained silent on the glaring contradiction between the date mentioned in the very first sentence of the fabricated letter and the one mentioned at the end. It is supposed to be a letter, conveniently dated January 2, 2018, the day after the violent attacks on the congregation at Bhima Koregaon. Its first sentence, however, refers to an “upcoming fact finding of December 6”. Both Patra and Times Now, the channel which first released this letter, spent considerable time to lay great stress on the purported date of the letter, but made no attempt to explain how a letter dated January 2 could ever refer to December 6 as an “upcoming” date. It is obvious that this discrepancy appears because of a hasty fabrication. The rules of media trials require a quiet cover-up. The rest of the letter also offers numerous indications of its frankly fictitious character, but it is not our purpose here to go into all of them. Perhaps one more point would suffice. The letter casually mentions the actual names of several persons, including of those arrested. It is a known fact, which has long been stressed by the police, too, that all Naxalites take aliases, and only such alias names are used in communication between them. This is a practice even among the Maoist parties abroad, such as in Nepal and in the Philippines. Thus, it is a contradiction in terms to claim that a letter is written by underground members of a secret party and at the same time to claim that the original names of the persons have been used. The other letters are even more ridiculous. One lists out the names of the persons supposedly involved in intra-organisational contradictions, court cases, courier work, arms purchases, and then proposes an assassination plot, all in one breath... phew! It has been lampooned enough to merit more attention. Even a senior politician like Sharad Pawar has said, " I spoke to a retired police officer, who had worked for CID. He said there is no substance in the letter. The letter is being used to garner people's sympathy." Another, an outlandish caricature of a threat letter to the Maharashtra CM, is only in the hands of select media houses. A prime time television anchor has selectively read out from it prominent names like that of Varavara Rao and Shoma Sen, without making the least attempt to provide any logical reason why any threat letter would ever carry any names. Another farce, however, is the claim that the letters now circulating in the media are letters recovered by forensic means from the hard disks of computers and laptops that have been shown to be seized. As per the procedure of the criminal law and the law of evidence, the electronic apparatus seized during any raid is required to be sealed and sent to a government forensic laboratory. It is only after the forensic report certifies that the files extracted comply with the provisions of the Evidence Act for acceptance as electronic evidence that such files or documents can be used in a court of law. The very act of the Pune Police of addressing a press conference and announcing that they have extracted letters and emails from the laptop of Rona Wilson’s computer vitiates the procedure for presenting such letters as evidence in a trial. The police or the court has not received any such report from the forensic laboratory. Such reports commonly take several years to reach the courts. In Arun’s case, the forensic report took almost three years. In Vernon’s case, it reached the court after five years. Thus, the claim of the police that they extracted files on their own implies that they were tampering with a device that was supposed to be sealed and sent to a laboratory. Such tampering could very easily include insertion of fabricated documents that are now being shared with the press. The possibility of tampering renders the media letters unacceptable as evidence in the court of law. But that does not seem to concern the police authorities or their political masters. The purpose is to create a fake political narrative. By the time it reaches the court, that purpose would have been achieved. It would be of no consequence to the state whether the case was won or lost. The media trial would have been conclusively won with all the political dividends it could bring. Also read: 'Saffron terror' or 'urban Maoism': What's behind Bhima Koregaon violence?